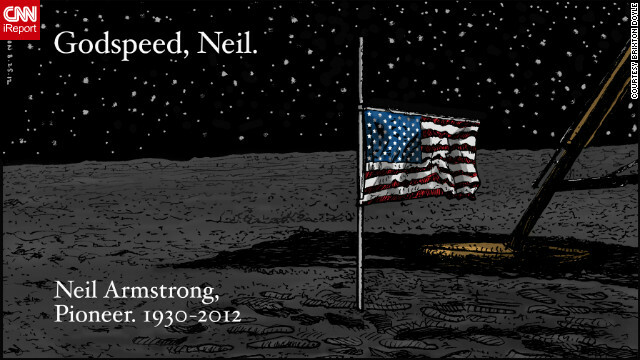 CNN iReport contributor Brixton Doyle submitted this cartoon as a tribute after the passing of Neil Armstrong. Earth's largest satellite helps create our tides and makes moonlit rides possible. The white ball adorned in shadows and craters has long confounded and beckoned us, and Apollo 11 Commander Neil Armstrong became the first human to set foot on the moon's dusty surface. Buzz Aldrin and Michael Collins were with him on a mission that inspired many more small steps. News that Armstrong had died got our readers reminiscing about the many little impacts from mankind's giant leap into the future. The moon landing had a fairly obvious impact on some readers. Neil Sakaitis of La Prairie, Quebec, owes his first name to Armstrong. "I was born in the 1970s and back then you just didn't throw out a name for your child. There was an importance to naming a child. My parents thought someone to walk on the moon was significant. They wanted to capture the hope." He says he felt great sadness when he learned that Armstrong had died. "I was talking to my dad, and he said your godfather passed away. My first reaction was, 'I haven't seen my father's side in ages,' and then my father said Neil Armstrong died," he wrote, and noted all the ways Armstrong had inspired him. "Neil Armstrong, thank you for your accomplishments, your inspiration, for allowing us to do great things (reaching Mars for example), and most importantly, for giving us a name to remember. You can be sure that I will continue to speak about you for generations to come, and people will always know, why my name is Neil!" 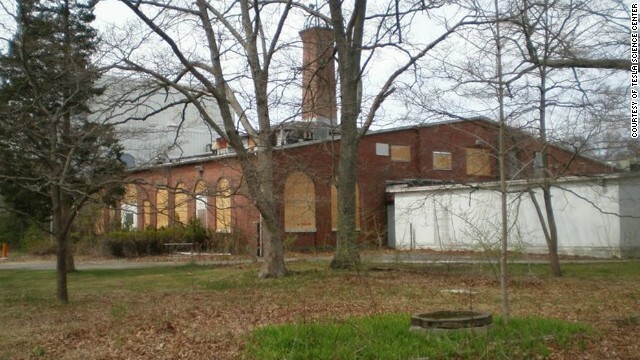 The site of inventor Nikola Tesla's former laboratory sits idle and boarded up in Shoreham, New York. Call Nikola Tesla a "cult hero" if you like, but some of our readers might take issue with you. News that Matthew Inman, the creator of Web cartoon "The Oatmeal," is collaborating with a nonprofit group to create a Tesla museum has commenters singing the futurist inventor's praises. Many say they think he deserves more recognition in the annals of scientific history. They hashed out the legacies of Tesla and Thomas Edison, sometimes viewed to be at odds. MDMick: "The article describes him as a 'cult' hero with far-out dreams, but Tesla was an accomplished scientist. He is the one who realized Edison was wrong by insisting on direct current public electricity supplies and it could be done more safely and much cheaper with alternating current. The modern American - and world - electricity grids are ALL based on Tesla's patents and first working systems he developed for Westinghouse. Edison tried to discredit Tesla and the 'Electric Chair' was invented to try to scare people away from AC current electricity. But Tesla was right and Edison wrong and AC prevailed as Tesla's calculations and foresight proved true - and made Westinghouse (now part of Northrup) a big name." Kevin Schooler: "Edison wasn't wrong about direct current being useful, he was only wrong about the application. Have you ever wondered why so many electronic devices have an AC adapter? That is because they must convert AC to DC in order to run correctly and safely. The only problem is that DC loses potency over distance. I'll never understand the whole revisionist 'Tesla Angelic/Edison Evil' paradigm. The fact is both contributed enormously to modern living, but Edison happened to be a better businessman." Editor's note: This post is affiliated with the Overheard on CNN.com series, a regular feature that examines interesting comments and thought-provoking conversations posted by the community.